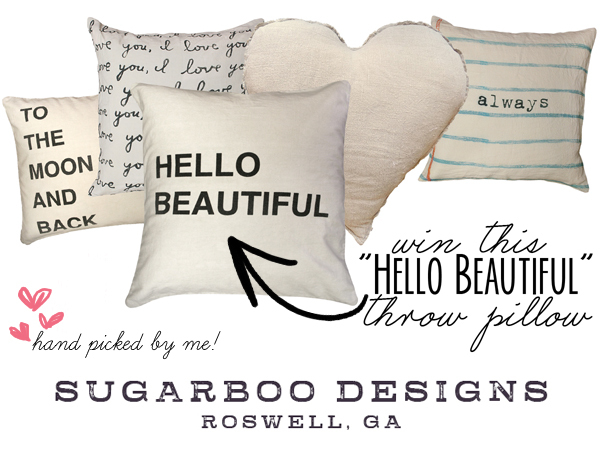 The third giveaway this week is for this "Hello Beautiful" throw pillow by Sugarboo Designs! It's my most favorite product in their current catalog and I just got one for my birthday!! I LOVE IT!! The pillow is HUGE and the quality is amazing! So many companies have you purchase the actual pillow separately so I was impressed that this pillow comes with a down feather pillow insert! So nice! I am obsessed with Sugarboo Designs!! I was first introduced to this company while working for Paper Source last year and they seriously make the cutest vintage inspired gifts and products for your home. I love that they're a local company too, based out of Roswell, Georgia. You can read more about Sugarboo Designs here. I also just heard about Sugarboo Farms which I definitely need to take Benjamin to! Read all about it on the Sugarboo blog. And check out our sweet pillow!!! 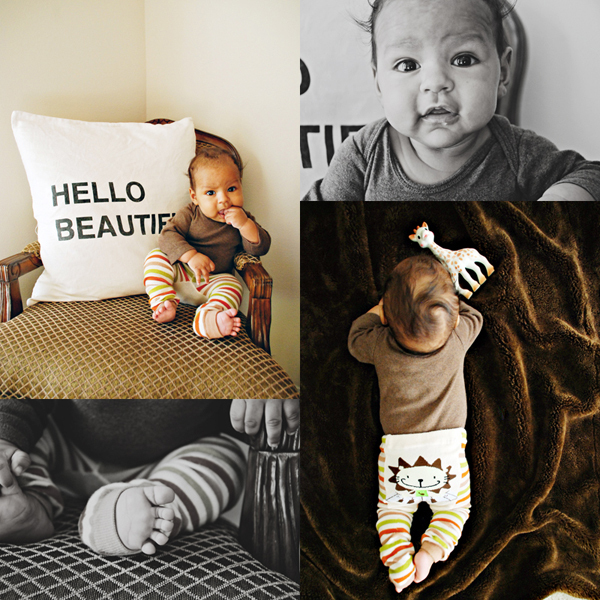 "The Hello Beautiful pillow measures 24" x 24" and includes a down feather pillow insert." love, love, love the pillow! is the adorable baby included if i win?!! love this pillow!! Too cute! I love this pillow. My fav is the one that says I Love You over and over again! Cute! Super cute. I need one for my bed!! Pick meeeeeeeeeee! Happy Happy Birthday beautiful girl!! Ohh gosh life has been so crazy for us since Hurricane Sandy. It has been so long since I checked in on you. I am smiling so big...look at these happy lil family pics!! Hoooray!! So beautiful! I'm so happy to have found you on Instagram tonight! Thanks so much for inviting us all to the party!! What a great way to celebrate your birthday :) I'm totally entering to win this one, so cute! Thanks for hosting such a cool giveaway! I love the hello beautiful and also the heart shaped pillow.